Are you stocking up on dried beans in anticipation of hard times to come? Me, too. Dried beans are nearly perfect prepper food. They store well, they’re versatile in recipes, they’re high in protein and fiber while being low in fat, and they’re crazy tasty. Nearly perfect. The downside of dried beans is that it takes a long time to cook them. Long cooking times generally means lots of energy consumption. Preppers are all about energy conservation, so the challenge becomes finding ways to cook foods that require long cooking times without burning huge amounts of energy. There are a number of good solutions to this problem, but if you took the time to read the title of this posting you’ve probably been waiting for me to stop beating around the bush and get to the topic of pressure cookers. 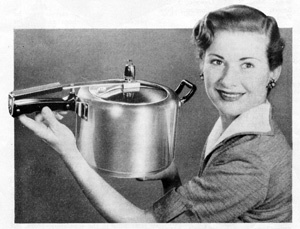 Pressure cookers are old school, but you may have noticed that a lot of prepping skills are old school. When it comes to prepping, we all need to “unplug” and step away from the gadgets (says the guy who’s writing this blog on his laptop while watching satellite TV on his HD big-screen). But I digress. Pressure cookers cook slow foods really quickly. Pinto beans cook in 12 minutes. Compare that to anywhere from one to three hours of cooking in a conventional pot. Lentils are ready to eat in just 7 minutes. Sandy asked what I was writing about and said, “What do you know about pressure cookers?” The true answer is “not much,” but I’m about to get a lot smarter because I’m about to read this awesome infographic that I downloaded from www.HipPressureCooking.com. They have graciously given permission for this excellent graphic to be used on our humble site. Be prepared to be entertained while you’re being educated.